If you are an art and antiquity lover, Pompeii and Herculaneum tour is something you cannot miss. These places are UNESCO World Heritage Sites since 1997. While there, everything will express a refined culture. Visiting Pompeii and Herculaneum brings you immediately to Roman age, a period with nothing similar in the following times. Everything you read in your guides or books will become real when you arrive there and you will find yourself to walk among frescoes, mosaics, statues, remains of colonnades and original furnishings. You will understand traditions and life of two thousand years ago and will meet a civilization that has remained intact and preserved for the future generations by the eruption of Mount Vesuvius: the eruption destroyed the Roman centers but left them frozen and hidden under a deep blanket of lava and ashes. Let’s go to see then the sites of Pompeii and Herculaneum, and let’s try to discover their history and pieces of evidence of an exceptional past. Pompeii and Herculaneum history is linked to Mount Vesuvius eruption in 79 AD. We know a lot of details of the eruption through the writings of Plinio il Giovane. The historian observed the eruption from the sea and wrote his impressions in two letters he sent to his friend Tacito, another famous Roman historian. He wrote about a gray-colored huge cloud which looked the same as an umbrella. The color appeared to be gray due to the ashes and dirt lifted up from the Mount Vesuvius eruption. It seems that the Romans didn’t know Mount Vesuvius was a Vulcano. They thought it was just a mountain and it could be one of the reasons why they didn’t understand immediately what it was happening: they lost precious time instead of escaping and saving themselves from the lapilli and the ash that eventually overwhelmed them. After the eruption, Pompeii and Herculaneum disappeared because they were buried under 10 meters of lava and ashes and the sites were lost in times. They were discovered then in 1748 and brought to light: they appeared as they were in the Roman ages, perfectly preserved in time and are today a priceless heritage for all the world. After a little historic excursion, let’s start to deal with some useful details to plan your tour of Pompeii and Herculaneum. Let’s start planning a Pompeii Tour. What to see in Pompeii, where to book a guided tour of Pompeii ruins, what are the opening times, how much time do you need to visit Pompeii ruins? Here you are everything you need to plan your perfect day tour to Pompeii. If you want to enjoy a Pompeii day trip and you want to take advantage of a guided tour of Pompeii, you can choose from a lot of professional local guides. While there, you can ask for a licensed tour guide at both the info points next to Porta Marina entrance and Piazza Esedra entrance, from 9,00am to 2,00pm. If you want to skip the line, you can book your guided tour online, looking for the licensed tour guides websites. Both if you buy the service there or if you buy it online, you will walk along the Pompeii ruins, visiting the Roman Forum, the Apollo’s temple, the ancient Basilica and all that there is to see in Pompeii, in the company of a guide who will tell you anecdotes and stories. From 1 April 1st to October 31st: Every day from 9 to 7.30 pm (last entrance is at 6 pm). From November 1st to October 31st: every day from 9 to 5 pm. The closing days of the Pompeii ruins, on the other hand, are December 25th, January 1st, and May 1st. Pompeii tour: how does it take? 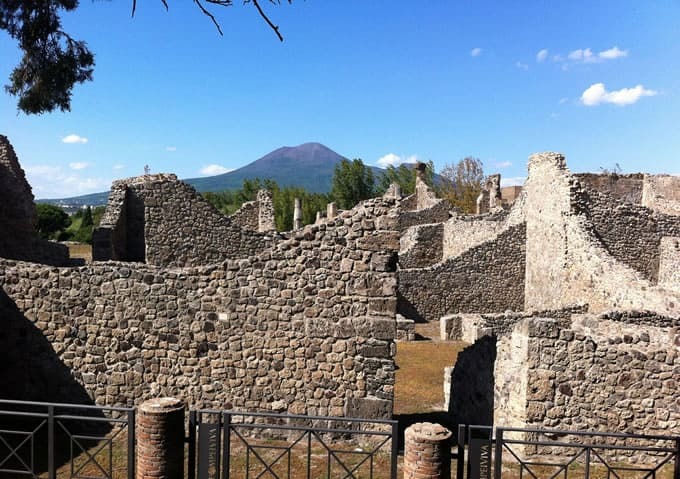 How does it take a tour to Pompeii ruins? It depends on the tour you choose. The 2 hours tour is the ideal for you if you have a little time or if you plan to visit both the archeological sites of Pompeii and Herculaneum in the same day. In two hours you will see the main sights as the amphitheater, the Forum, the temples of the gods Isis, Jupiter and Apollo, the House of Faun, the Basilica and the Macellum. The long-lasting tour requires instead at least 6 hours. It allows you not to miss anything about the site. I advise you to start your tour from the Porta Marina entrance and then to go along Via dell’Abbondanza. Don’t forget that you can buy the entrance tickets at the official ticket offices in the archeological park or online, in the authorized websites. Every other type of ticket sales is not legal and linked to the park. In some conditions, the entrance is free. To know more about, please read the Tickets and Info Page at Pompeii ruins website. Herculaneum ruins are another wonderful ancient site. They complete the visit to Pompeii ruins, even if the findings are very different. What is impressive in Herculaneum is the excellent state of conservation of some finds, among which the papyri found in the library of the Villa dei Papiri stand out. These are charred ‘books’, but thanks to some advanced techniques they can be rolled out and read. They give a truly exceptional evidence of an era that has been preserved intact even in everyday objects you can admire in your tour to the excavations of Herculaneum. Here is what to know to plan your Herculaneum tour. As for Pompeii, you can take advantage of licensed local guides also in Herculaneum site and you can book this service online at the authorized websites. The Herculaneum ruins entrance is in Corso Resina. I advise you not to miss the Multisensory visit to Herculaneum ruins. You can touch some items in the path, notice some noises and smells, so you can experience the archaeological park with all your senses. From November 1st to October 31st: every day from 9 to 5 pm (last entrance is at 3.30pm). The closing days of the Herculaneum ruins are December 25th, January 1st, and May 1st. Herculaneum tour: how does it take? Herculaneum tour is about 2 hours. In your visit, you will walk along the insule, the Roman districts which are enclosed by the crossing of cardi and decumani. 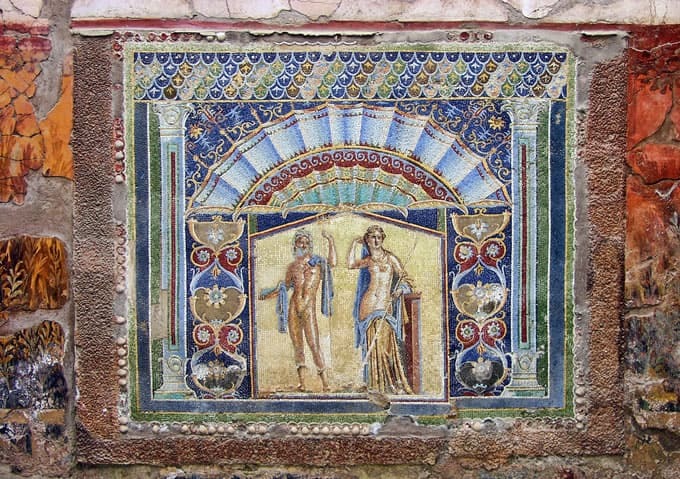 You will visit frescoed residences, with wall mosaics and floors. Do not miss the Argo House, the house of the Skeleton and that of the Hotel. If you want to visit the theater, however, you will have to exit the excavations and reach Corso Ercolano 119. Both in Pompeii and Herculaneum ruins, the entrance is free on the first Sunday of every month and for European Union citizens up to 18 years old. Now you have all the details to visit Pompeii and Herculaneum ruins. Everything you need to know actually is how to get to Pompeii and Herculaneum. To get to Pompeii and Herculaneum from Naples is the best choice. You can get there in two ways: by car or by train. To get to Pompeii and Herculaneum from Naples by car, all you have to do is to take the A3 motorway and to take the E45 road, towards Salerno, exiting at Pompei Ovest (Pompeii ruins) or Ercolano (Herculaneum ruins). To Pompeii, it will take about 30 minutes from Naples, to get to Ercolano it will take just 20 minutes. How to get to Pompeii and Herculaneum from Naples by train? You have to take the Circumvesuviana train in Naples. To Pompeii: take the line Naples-Sorrento and go out at the train stop Pompei-Scavi (Pompeii ruins). You need just 35 minutes. To get to Herculaneum: you can choose among the Naples- Sorrento, the Naples — Poggiomarino and the Naples- Torre Annunziata lines. The way is about 20 minutes long. What to add to this small guide about how to plan your tour to Pompeii and Herculaneum ruins? I want just to tell you that if you love cultural travels and excursions, you cannot miss this tour. While there, you will enjoy an amazing experience and you can choose to live everything with the comfort you desire if you decide to rent a luxury vehicle with private driver. Your personal driver will take you to Pompeii and Herculaneum, and he will give you also some tips about places to get lunch or dinner. Do not miss this opportunity. Do you need other information? Write me in the comments to know how to visit Pompeii and Herculaneum in exclusive cars with a private driver. Ancient Rome awaits you. 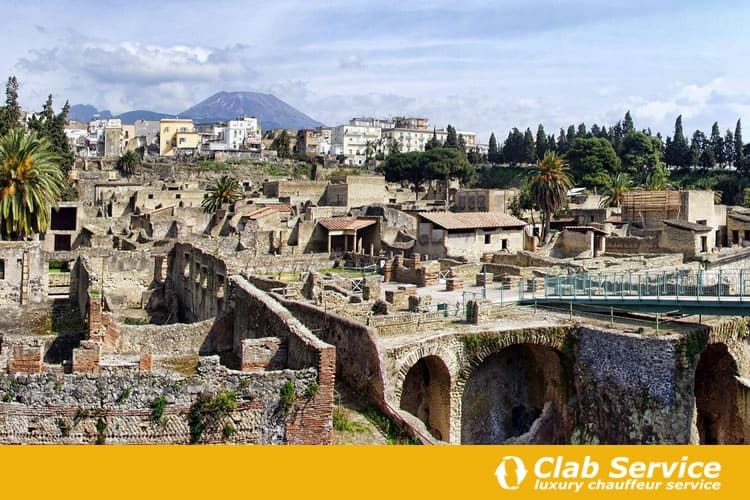 Rent your luxury car and discover the ancient Pompeii and Herculaneum ruins in just one day.